We were happy to hear from Charles and Eimer. 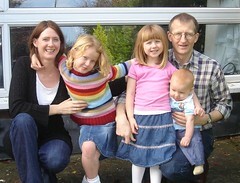 They sent us this nice family picture with their children, Aisling (age 6), Sarah (almost 4) and Thomas (born in April). Lisa worked with Charles at Price Waterhouse in London many years ago.